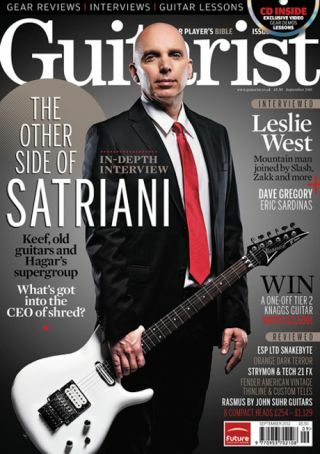 Guitarist issue 346 – on sale now! We catch up with the legendary Mountain guitarist just weeks after he tragically lost his leg due to complications arising from diabetes, and find him in remarkably good spirits and excited about his star-studded new solo album. The slide guitar cowboy shares with us his secrets of tone, attitude and technique. The original name behind the lunchbox amp's astonishing revival returns to the game with an amazingly affordable head that's aimed squarely at the metal crowd. Legendary US luthier John Suhr takes all of his guitar making expertise to the far east, producing some amazing new electrics that offer astonishing playability and quality without the wallet-busting price of a USA Suhr guitar. Q&A, all the latest gear and artist news, your letters, columns, album reviews, reader ads and much more! Guitarist issue 346, is available now from all good UK newsagents, or as a digital magazine for PC, Mac and iOS and Android from Zinio. Non-UK readers can purchase a copy from www.myfavouritemagazines.co.uk, or UK readers can subscribe and receive a free gift! For more information about Guitarist's digital editions, please click here.